Prior to the 2004 Indian Ocean Tsunami the United Nations designated the conflict in Darfur, Sudan "the world's worst humanitarian crisis." However other bodies consider the Asian Tsunami lower on the scale of humanitarian concern. What is clear is that the situation in Western Sudan is a major human catastrophe with civilians killed, starved and forced to leave their villages. The Darfur conflict is an ongoing battle in the Darfur region of western Sudan. The war erupted in 2003 when two armed movements - Sudan Liberation Army and the Justice and Equality Movement - began a rebellion against the Sudanese government in Khartoum that had neglected their region. In response, the government mobilised, armed and directed a militia, known as Janjaweed ('rabble' or 'outlaws' in local dialect), using scorched earth, massacre and starvation as counter-insurgency weapons. The conflict has been widely described as "ethnic cleansing", and frequently as "genocide". Nobody really knows how many people have died during the current conflict in the Darfur region. The UN says that more than two million of the estimated six million population have fled their homes, but the organisation is reluctant to estimate how many have perished. Some analysts estimate that the death toll could be as high as 350,000. One significant problem in establishing a clear death toll is that the Sudanese government and their allies, the Janjaweed, are responsible for most of the deaths. The Sudanese authorities consistently underplay the scale of the crisis, and you can witness this approach yourself when watching Sudan Television on Asiasat 3. Hopefully the situation in Darfur will improve with discussions mediated by the African Union now starting to head towards a possible solution. In mid 2005 the Sudanese government and two rebel groups have agreed on ground rules for efforts to resolve the conflict. The media in Sudan operates in one of the most tightly controlled and restricted environments in Africa. The Sudanese government demands that the radio and television of the nation reflects official government policies. The BBC reports that there is a permanent military censor at Sudan Television to ensure that the news reflects the official line. In 1995 Sudan entered the satellite television age with the opening of the earth station at Omdurman. To establish an audience for the Sudanese Satellite Channel over 750 dishes were distributed to "viewer clubs" throughout the Arabic speaking population. Daily viewing is dominated by Arabic language programing. Islamic teachings including readings from Quran and programs such as Quran Encyclopedia, Morning Contemplation togeather with morning, afternoon and evening prayers account for up to 50% of the program day. "The English Magazine" presents Sudanese news and commentary around 3 PM Khartoum Time (11 PM Australian Eastern Time). Evening programs include musical programs, concerts, cultural news and Arabic soap operas such "Disobedience". Two government-operated radio outlets are available via Asiasat 3. The National General Program (Sudan Radio) broadcasts 24 hours per day in Arabic. 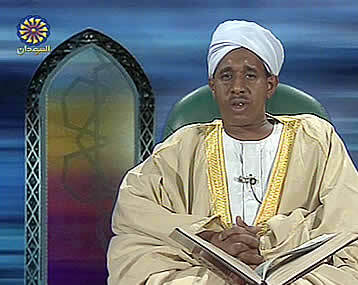 Radio Omdurman Holy Quran presents 24 hour per day religious programing. Sudan Television is featured within the MediaExplorer package on DVD Disk Three. Radio Sudan and Radio Omdurman Radio Quran are featured within the Satdirectory package on DVD Disk One. Sudan, in north-eastern Africa, is the largest country on the continent. The majority of the population is concentrated along the banks of the River Nile and in the fertile central provinces of El Gezira, Khartoum and al-Abyad (White Nile). The northern part of the country comprises a flat, barren, rocky Saharan desert plain, stretching west to an area of sand dunes. In the far west the elevation rises to 3071 m at Jebel Marra, an isolated extinct volcanic cone in the Darfur Massif. Other upland areas include the Red Sea coastal region (average elevation 2000 m) and the Imatong Mountains in the extreme south, bordering Kenya and Uganda and climbing to a maximum elevation of 3187 m at Mt Kinyeti. The River Nile crosses Sudan south-north with Khartoum (the capital city)located at the junction of the White and Blue Niles.